Two young players, Noe Baba and Adam McDonnell, who are signed with DB Sports Tours, are set to be involved in the upcoming Under-19 Ireland fixtures. The Republic of Ireland U19 side will play their UEFA U19 Championships Qualifying Round Group Six fixtures this month. Paul Doolin, the manager of the Under-19 side, will see his team play both Malta at Waterford’s RSC on Thursday, November 13 (7.45pm), and then host Gibraltar at Wexford’s Ferrycarrig Park on Saturday, November 15 (7.45pm) before finally finishing up the tournament against Switzerland on Tuesday, November 18 at the RSC (2.00pm). Noe Baba is set to captain the side once more, like he has in previous fixtures when the Republic of Ireland Under-19’s faced Holland last month in Tallaght Stadium. Baba, 18, currently plays for Fulham 21′s and is renowned to be the first African-born player to captain a Republic of Ireland age group when he led the Under-17s to the European Championship Elite phase. This is an amazing achievement considering this is Baba’s third U19′s European Championship playing the previous two campaigns aged only 16. Adam McDonnell meanwhile, who plies his trade for Ipswich, has notably featured for the Under-21 in games this season against the likes of the mighty Hammers, wherein he has faced up against Alex Song, Ravel Morrison, and Diafra Sakho, who’s currently scoring goals every week in The Premier League. Adam started this year as a Shelbourne U17′s player and quickly impressed to gain a permanent place in the U19′s but this didn’t last long when Adam caught the eye of first team manager Johnny McDonnell and within a matter of weeks Adam was making his first team senior debut. Unfortunately for Shelbourne’s Division 1 side, Adams stay at senior level came to a very quick end when once again he caught the eye of another top manager Mick McCarthy and Mark Kennedy and Adam was soon packing his bags for Ipswich where he has taken the 21′s by storm. It is also important to note Adam McDonnell is the youngest player in the Irish squad as he is still eligible to play U18′s. 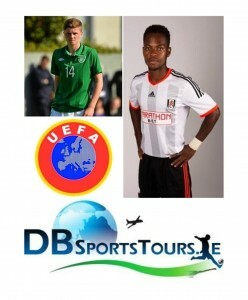 For more information on how the lads get on with the Republic of Ireland Under-19s keep an eye on the DB Sports Tours blog here.